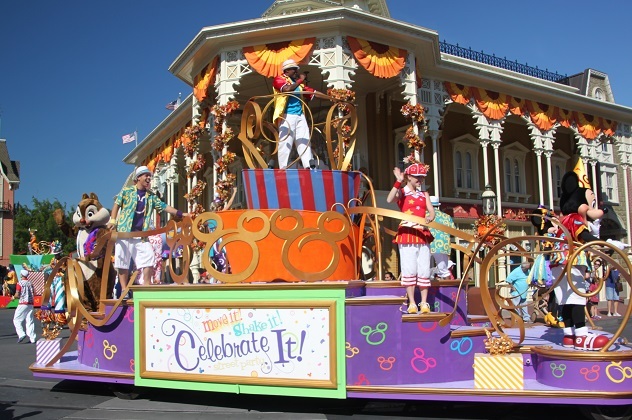 A big part of the Disney and Magic Kingdom experience is the parades. We loved all of them from the trolley dancers to the first parade we happened upon – the Move It, Shake It, Celebrate It Street Party. We were just ambling around Main Street one morning when the music started to blast out, people cleared off the road and a load of colourful floats started heading our way. Full of energy with loud music and great costumes, this parade heads down Main Street several times a day. We only managed to see it once – an indication of how much there is to do here. They stop at various points, get children standing at the road side to join in and blast out contemporary music. 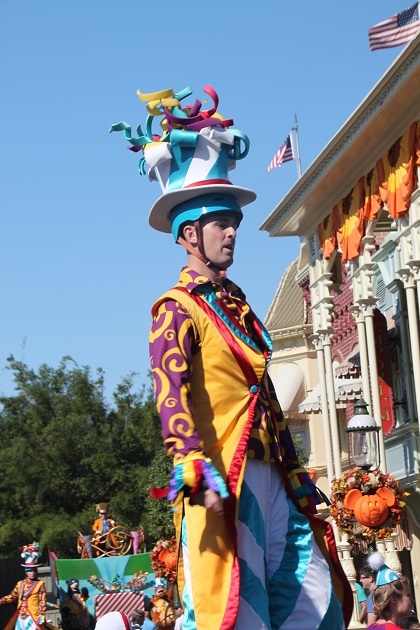 The energy is infectious and with stilt walkers, floats, Disney characters and more there is so much to look at as they make their way past. 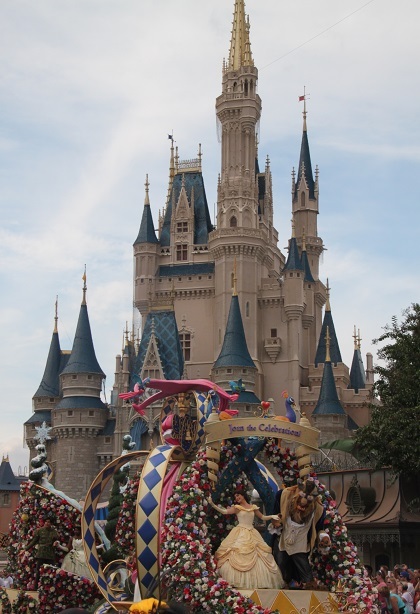 The main parade in the Magic Kingdom is the Festival of Fantasy – we watched it on our first day and several other times after that. We never had an issue getting a great view, watched it in several different lands and didn’t really think there was a “best spot” to check it out. 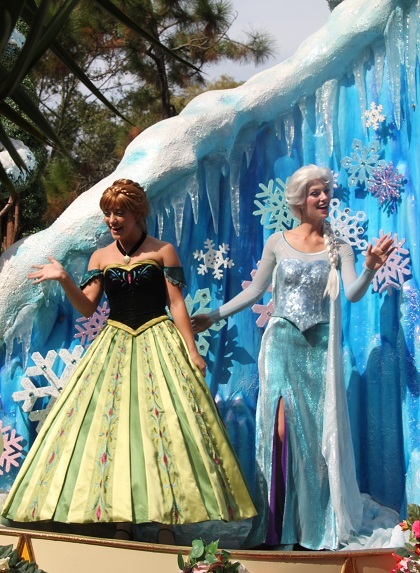 The floats are wonderful, the costumes are stunning and the soundtrack features songs from Disney movies. Each float told a different story. My favourite was Brave – I have to confess to never having seen that movie but I loved the kilts and Scottish theme. 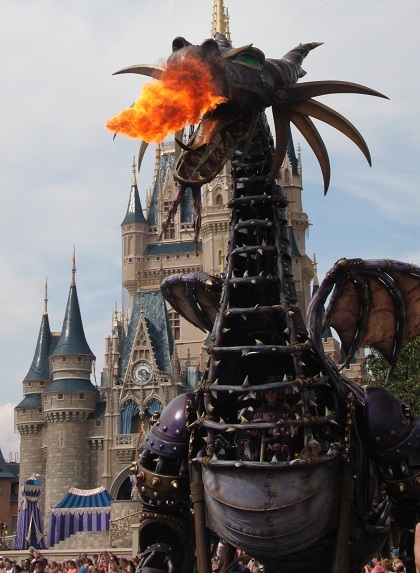 The Maleficent Dragon from Sleeping Beauty was quite incredible – 35 feet long and 26 feet high, there were thorn stilt walkers alongside and when that dragon breathed fire – a wow moment. We stayed late one evening at the park to check out the Main Street Electrical Parade. I remember this being a highlight of mine in the past, it still did not disappoint. Plenty of great lighting effects, technology and still that incredibly catchy music. As if that wasn’t enough, we followed the crowds to get a good spot for the Wishes Night Time Spectacular – apparently the largest fireworks display ever presented at the Magic Kingdom. It was just stunning – amazing pyrotechnics exploding around and above Cinderella Castle is just the way to end the day. Looks like great fun! Thank you for sharing! It is – and a real spectacle too!! We just went to see this years Disney on ice show and our kids loved to see the Disney characters. I can only imagine how in awe (=hypo…;) ) they would have been there! It is incredible – kids love it and adults just can’t help getting caught up in all the excitement too – Disney is unbeatable at this sort of thing! 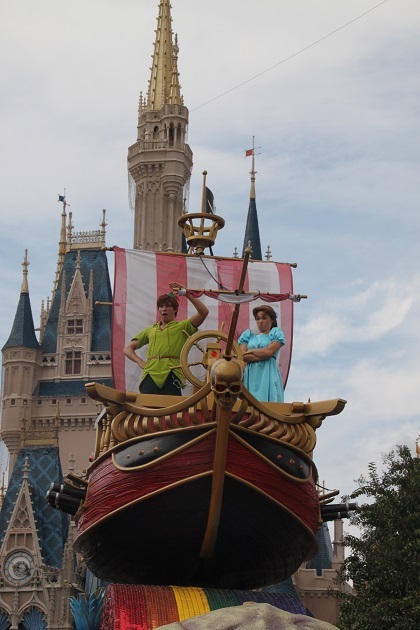 It is amazing in Orlando – a real spectacle! 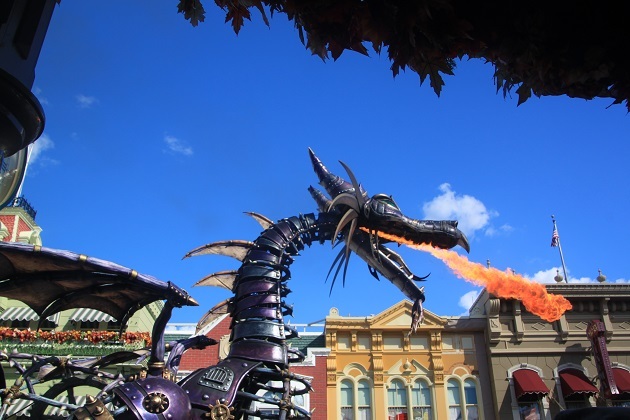 Woo – love the dragon photos, especially the one from the side with the flames shooting out. Not sure about the kilts – not any tartan I know! 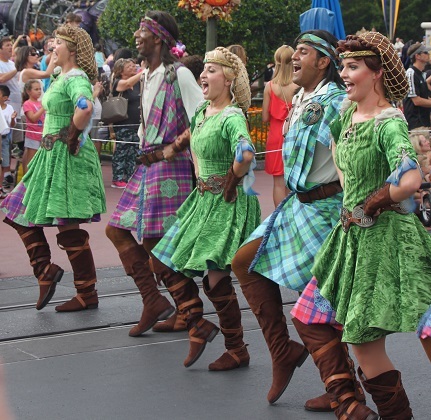 I guess Disney tartan will be larger than life though. Looks great fun. It definitely brings out your inner child!! And those kilts…. well I suppose everything has to have a Disney spin on it, maybe they should have left well alone there!! Oh it is just so much fun for children (and the adults too!!). Looks great fun for all ages, lovely photos, too! You definitely don’t have to be young to enjoy it!! I think every child of a certain age loves them – boy or girl!! This post brought back memories! Happy ones! That’s great to hear – it does have that kind of effect on me too, albeit the memories are quite recent! I’ve always been a big fan of the parades, and fireworks at the Disneyland/World. I’ll never forget seeing my first parade at Disneyland. I was 8. I thought it magic! The whole day was amazing then Tinkerbell flew across the park from way up high on wire from the Matterhorn, then there were the most beautiful fireworks. It was memorable, and sure made an impression on me. 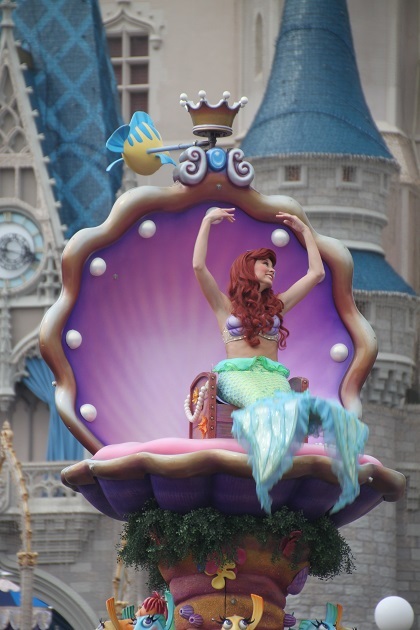 I saw my first Disney parade in my 20’s and was blown away too – it made a big impression on me even then!! 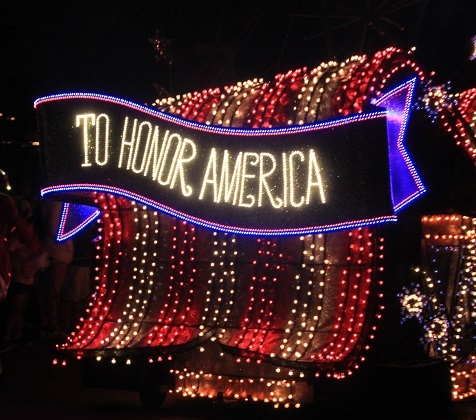 Those parades, especially the ones at night, are really special. 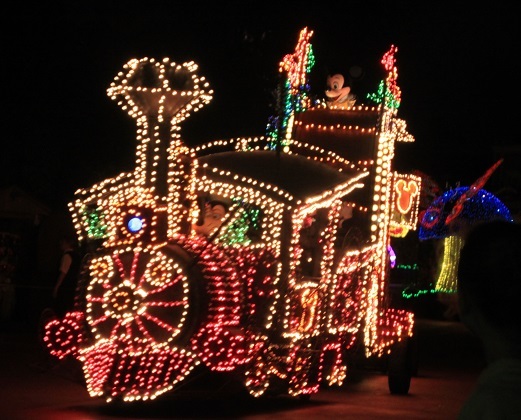 Thanks George – there is just something about watching a Disney parade in the dark that sends tingles down your spine!! Fantastic photos. My kids would love to visit one day. It’s such a great experience – but for the adults too!! The fireworks here are incredible Rosemary – like nowhere else for sure. 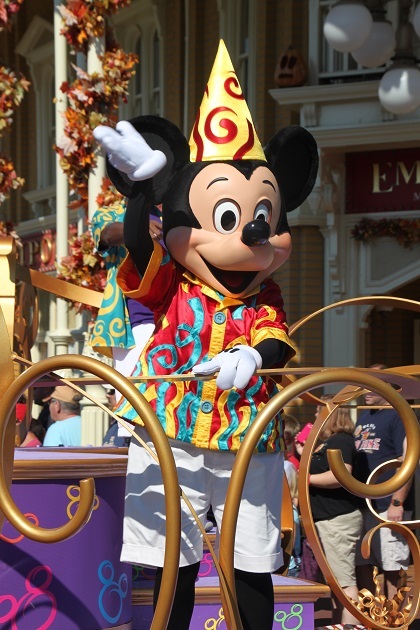 We saw the Euro Disney parade too but I think they go all out here – it is just amazing and you can’t fail but be impressed by it, whether you know the Disney characters or not!! Hope your week was a bit cooler and the weekend is a great one too. I think layers are key here Rosemary – winter or summer you know what the UK is like, unpredictable is the key!! We’ve had a miserable wet weekend but the sun is shining this morning – always makes you feel better! Disney does them so well!! We saw the Hallowe’en one and of course this one – Christmas seems like it would be something fun to see too. Nice photos! Looks like you had some pretty nice viewing spots! Thank you – we did watch from different spots and got some great views but were there late October when the parks are not so busy – that helps!! I noticed you spent some time in Belgium and am interested in going there this summer… Possibly early July. How many nights would you suggest for Bruges? We rented a house there and stayed for a week, we actually used it as our base to explore other parts of Belgium – the coast, Brussels, the war sites, Ghent etc.. That worked really well – nowhere was more than an hour away by car but if you just wanted to see Bruges I think a couple of nights would probably be ok. 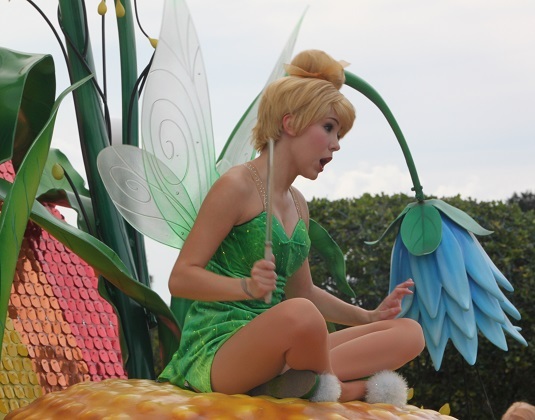 The female actresses are always so eye catching on the stage of the parade. Great photos. Absolutely – with their colourful costumes they make quite a spectacle! !